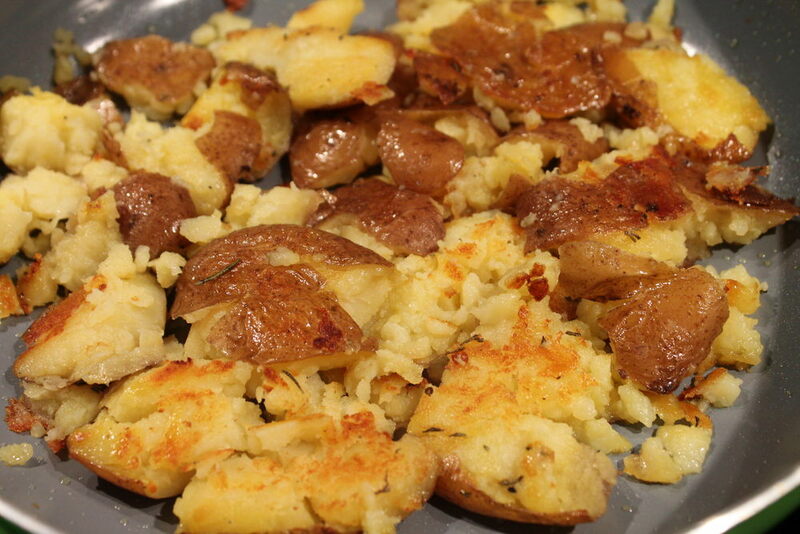 Clean the potatoes and put them on a sheet pan. Pour about 1/2 cup of water on the pan, then cover tightly with foil. Bake at 350 degrees for about 45 minutes or until the potatoes are cooked completely. You can prick them with a fork to test for doneness. Remove the foil and drain any of the water that's left in the pan. 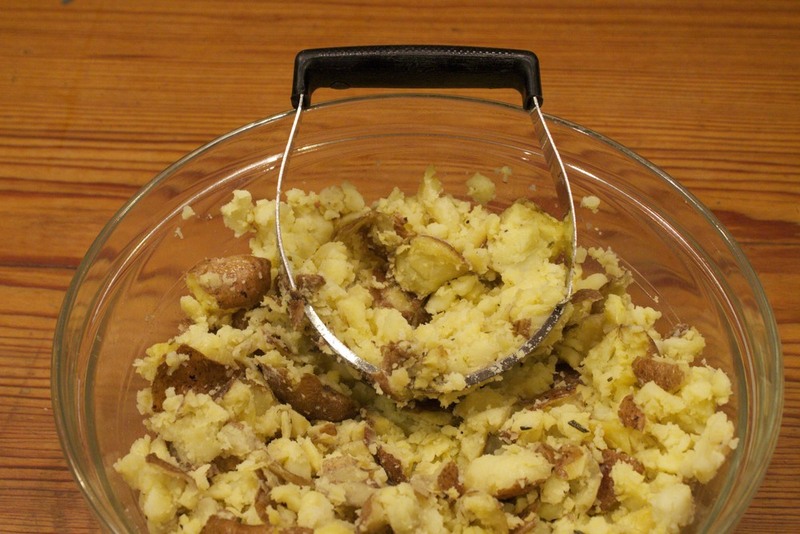 Using a large spoon, smash each of the potatoes to a thickness of about 1/4 of an inch. After all the potatoes have been smashed, drizzle them with olive oil, then salt & pepper to taste and sprinkle on the chopped rosemary. Put the potatoes back in the oven at 450 degrees and cook for about 15 minutes. I served these with meatloaf, green beans, and quick beer bread. Yummy! For breakfast the next morning, I fried some of the potatoes in a skillet with a little olive oil. After the bottom got a nice crust on it, I turned the potatoes over to brown the other side. While the other side was browning, I sprinkled a little cheese on the top to melt. 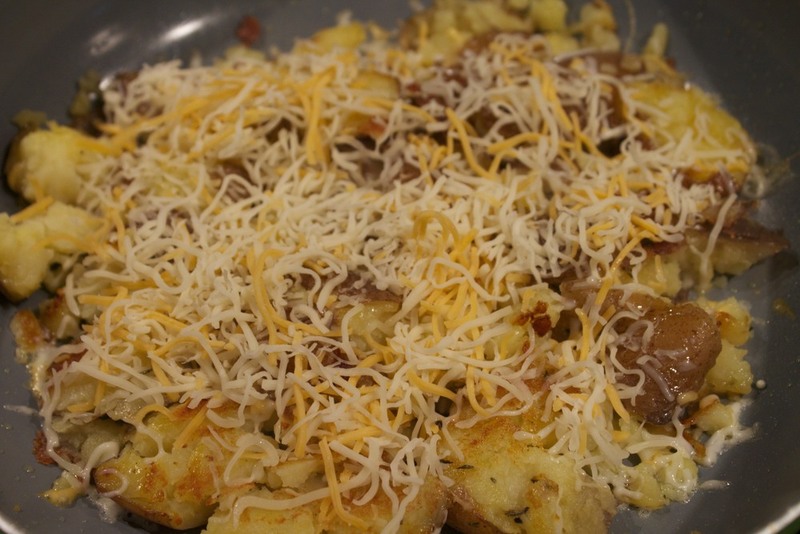 When the bottom was brown, I removed the potatoes to a plate and fried an egg in the same skillet. Then I topped the potatoes with the egg and served with bacon and a piece of the leftover beer bread with honey butter. Still have some potatoes left? 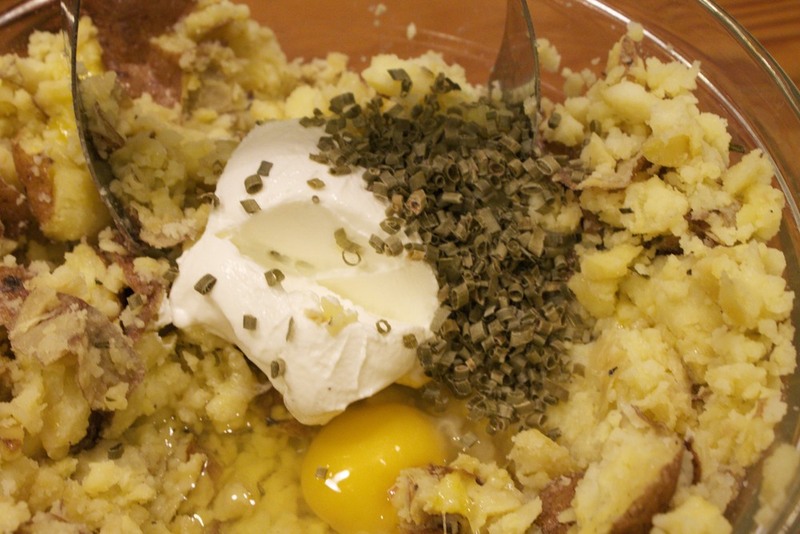 Mash the remaining potatoes in a bowl and add 1 egg, mixing to combine. 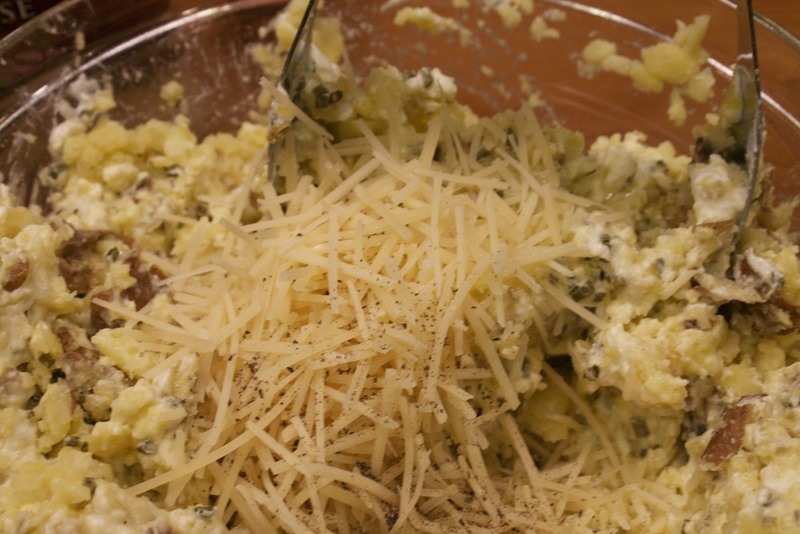 Now add sour cream, parmesan cheese, and chives and combine. 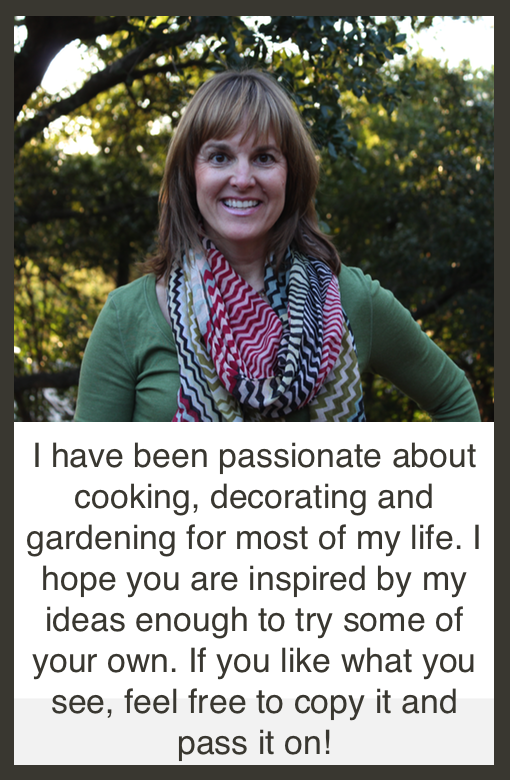 You want the consistency to be like mashed potatoes. 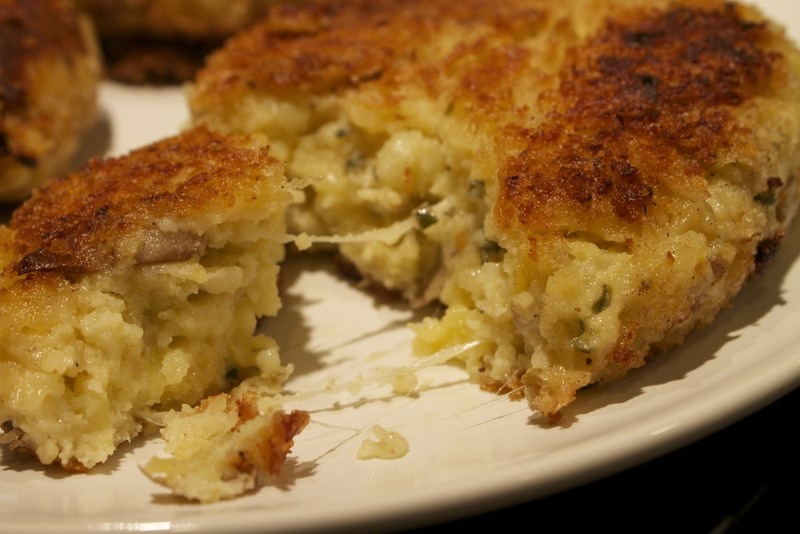 Form the potatoes into patty shapes and dredge in panko bread crumbs. Fry in a skillet with a mixture of butter and olive oil until golden brown on each side. serve warm. That's it. Three different meals from one batch of roasted potatoes. Posted in In The Kitchen and tagged with potatoes, leftovers, side dish. March 7, 2013 by Lynn Adams.